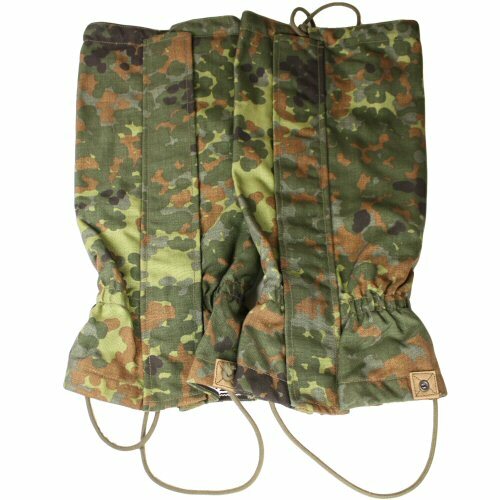 German forces issued flecktarn cordura gaiters for protecting the lower leg and preventing mud and wet ingress between boot top and trouser. 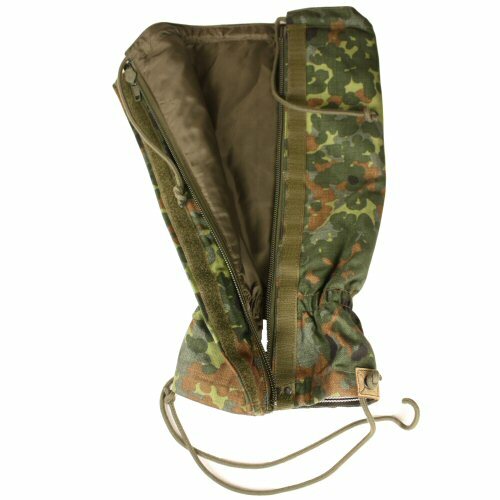 Gaiters are an essential part of kit when walking through wet and muddy terrain. These are elasticated internally along the bottom edge and around the ankle. To prevent riding up, these have a cord or strap to run from the bottom of the gaiter, under the boot, and to the other side, also aided by a hook located by the zip front for fixing around the front lace of the boot. The gaiters are closed with a zipper and velcro-down flap, secured with velcro along the entire length of the opening. The Cordura is thickly coated on the inside with durable PU coating and lined with nylon. The top can be drawn together with elasticated drawstring and toggle for a more secure fit. Sold in pairs.